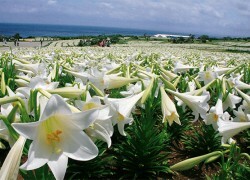 The northern part of Okinawa is blessed with the stunning allure of subtropical nature. 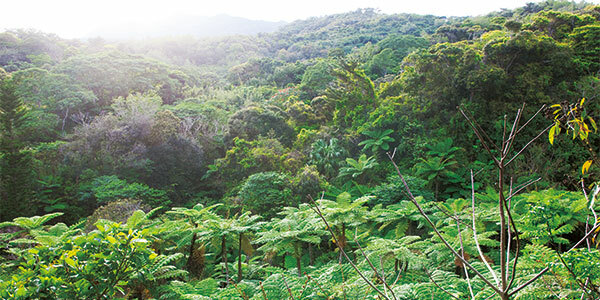 The area, including Kunigami, Ogimi, Higashi and Ginoza villages in particular, is called Yanbaru and is known as one of Japan’s most prominent natural areas, similar to Iriomote Island. The woods of Yanbaru are filled with plants, insects, birds, amphibians and reptiles, some of which, such as natural treasure the Okinawa rail, a flightless bird endemic to Yanbaru, are rare in any other part of the world. With a number of pristine beaches and various lodging options, including cottages, resort hotels and guesthouses as well as campsites, the Yanbaru area is a paradise for nature and outdoors lovers. On the other hand, Nago City, Motobu Town and Nakijin Village are home to a variety of tourist attractions, including the popular Okinawa Churaumi Aquarium. Dotting the coast and forest in this area are a number of cafés and restaurants set in great locations that afford views of the emerald green ocean and the lush greenery. Ferries for the islands located off the Motobu Peninsula, including Ie, Minna and Iheya islands, depart from various ports around Motobu Town. 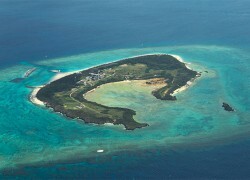 Sesoko and Kouri islands are connected to the main island of Okinawa by bridge and can be accessed by car. 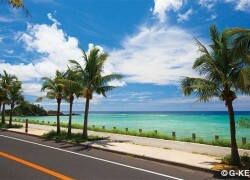 Moving further north from Nago City, you will be impressed by the beautiful landscape of Okinawa. Located here is the northernmost municipality of Kunigami Village; to its south are Ogimi Village, famous for basho-fu textiles and longevity, and Higashi Village for ecotourism. Being a less densely populated area of the island with a small number of commercial establishments, these three villages are home to vast expanses of pristine natural beauty. 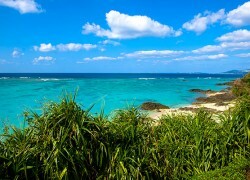 The resort coastline of Onna, located between Yomitan Village and Nago City on the East China Sea side of the island, is one of Okinawa's popular resort destinations. The water, with a beautiful gradation of color, and white sand beaches make this area ideal for a drive. 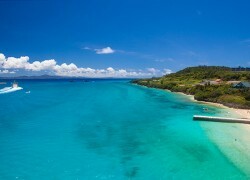 A number of prominent resort hotels including the Renaissance Okinawa Resort, the Rizzan Sea-Park Hotel Tancha-Bay, the Sunmarina Hotel and the ANA InterContinental Manza Hotel & Resort are situated in the village as are restaurants featuring aguu pork and Ishigaki beef and specializing in Okinawan cuisine. Spending time at the convenient and safe beach of a resort hotel and enjoying marine sports are recommended for families with children. 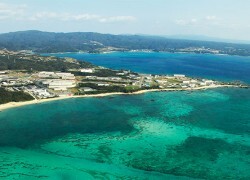 Kin Town and Ginoza Village are located on Okinawa's east coast, bordering Onna Village to the west. The major part of both Kin and Ginoza -- more than 50 percent of which is occupied by the U.S. Marine Corps, including Camp Hansen, the Ginbaru Training Area, the Kin Red Beach Training Area and the Kin Blue Beach Training Area -- is covered with rich greenery and surrounded by rural scenic beauty. Ie Island is a small island measuring 22.73 kilometers in circumference, located a 30-minute ferry ride away from Motobu Port in northern Okinawa. One of the must-dos on the island is climbing Mount Gusuku, popularly known as Tacchu. 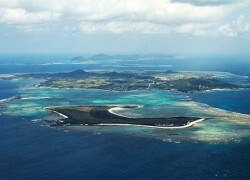 Tacchu, a craggy mountain with a sharp top, is visible from the main island of Okinawa. It is the symbol of Ie Island, and you can enjoy a spectacular panoramic view from the peak. The coastline in the north part of the island consists of steep cliffs rising to about 60 meters above sea level, while the south coast is blessed with stretches of sandy beaches. Situated off the Motobu Peninsula, Minna Island is affectionately known as “Croissant Island” due to its unusual crescent shape. The water of Minna Island is known for its clarity, and its beautiful beaches are pure white sand, with scenery reminiscent of the Caribbean. Reefs are located offshore, allowing the whole family to safely enjoy sea bathing and snorkeling.